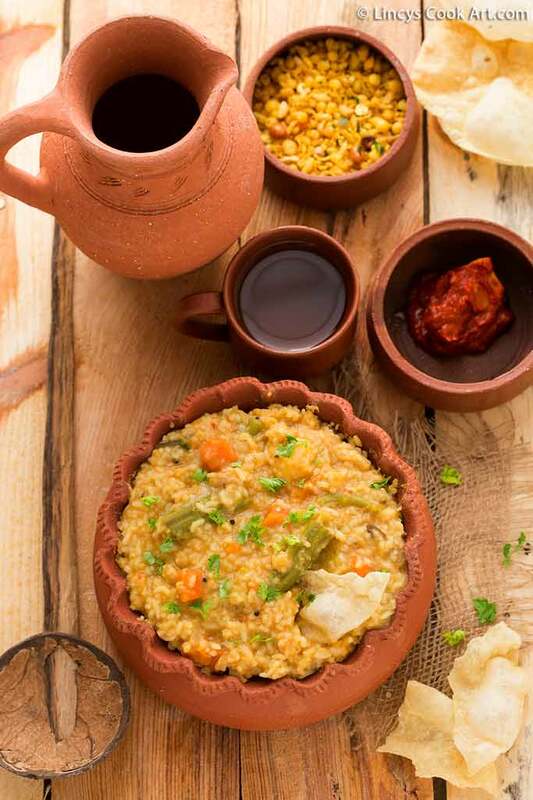 Sambar Sadam or Sambar Rice is a South Indian comfort food which is one of my favorite variety rice. In my native they wont make sambar sadam i have tasted this rice first when i was doing my under graduation. Initially i was not a big fan of this rice. Once they serve this rice with crispy fried potato chips i started loving it and now with simple papad or pickle i could relish this rice. 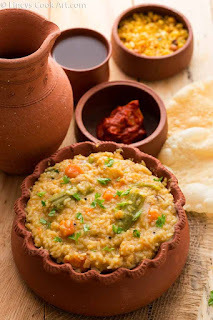 My husband and kids likes this sambar rice with mixture. If i donot get time to fry potato chips my choice would be papad. 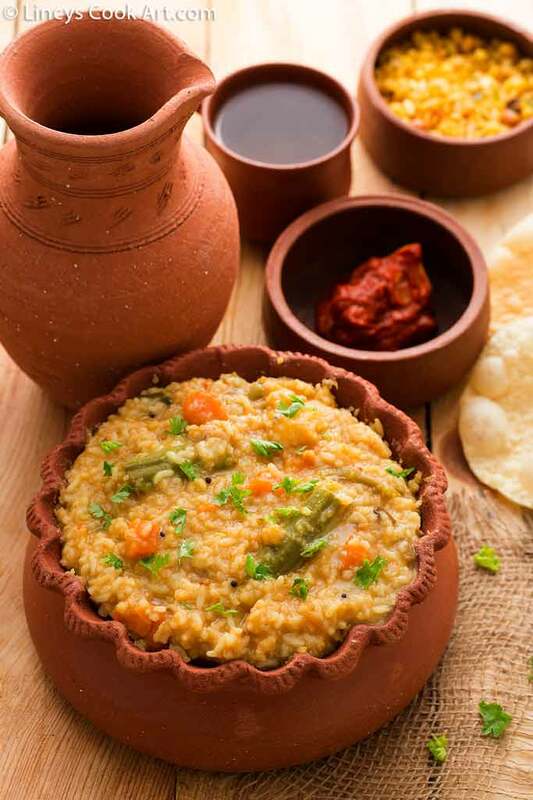 After marriage i was making this sambar sadam in normal pan i just make sambar and then cook the rice separately and mix it well and allow to simmer. Once life got busier i started to use all shortcut tricks in all my detailed curries, biryanis and rice. Likewise i started making this rice too in pressure cooker. This saves my time and tastes delicious as the rice is cooked in the maslas. Nowadays I make it less spicy to make sure my son too tolerate the spice level. Wash and soak the rice and dal just prior to chopping the veggies or 20-30 minutes. Peel and chop the veggies into medium sized cubes. Cut the drumstick into 2 inch long pieces.Chop the onion lengthwise and finely chop the tomatoes. In a pressure cooker (above 4 liter, i have used 5 liter pressure cooker here) heat the oil and splutter the mustard seeds, fenugreek seeds and cumin seeds. Once the mustard seeds splutter and fenugreek seeds becomes golden colour add the curry leaves and asafetida and fry for a second. Now add the chopped onion with a pinch of salt and cook for a minute and then add the tomatoes and cook for a minute or two till the tomatoes starts to become soft. Add the cut veggies with some salt and saute for a minute. Add the masala powders turmeric powder, chilli powder and coriander powder. Then add a cup of tamarind water; mix well and allow to boil for a minute. Now add the soaked rice and dal with some salt and 4 cups of water; mix well. Close the pressure cooker and cook for 3 whistles and switch off the gas. Once the pressure releases open the lid and drizzle a teaspoon full of ghee and sprinkle some chopped coriander leaves and mix well. Serve hot with Papad, Potato chips, Mixture or Pickle of your choice. The amount of water which i have mentioned to add looks like too much but it is just perfect for sambar rice. 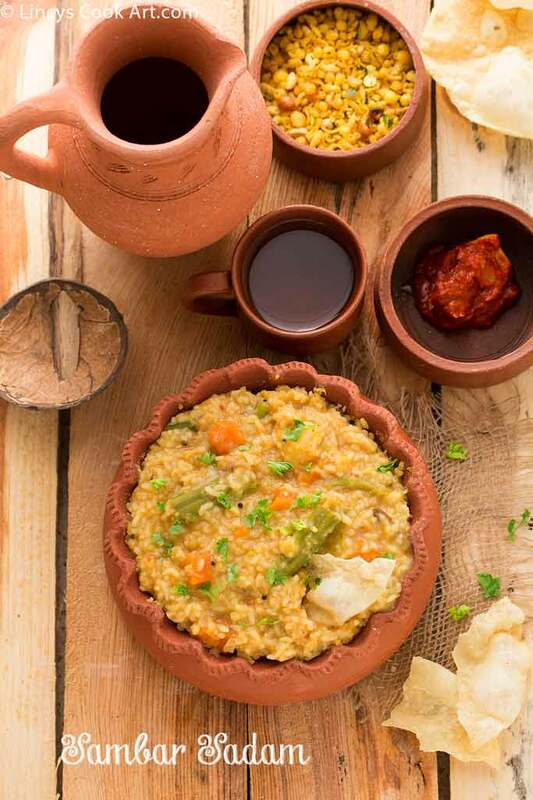 The dal in this dish makes the rice subsequently thicker once the rice cools down. You could use sambar powder instead of these masala powders mentioned. 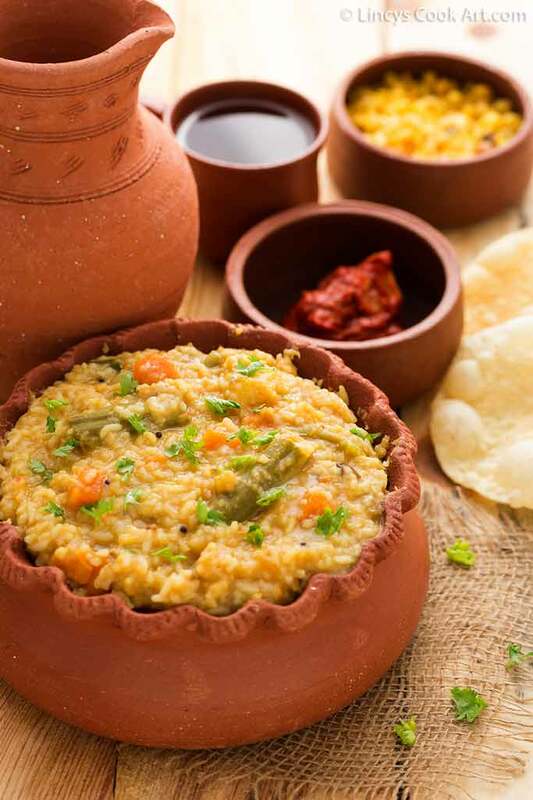 Karnataka region they call it as Bisi bele bath, it is same as that of sambar rice i guess Rafee.